The PowerShot A3400 IS delivers high image quality for the price. It offers beginners a Help button, and keeps the features to a useful minimum that should work well for most everyday shooting needs. The touch screen doesn't perform as elegantly as a smart phone, but it's still convenient to be able to access some features with the tap of a fingertip. Read more in our Full Conclusion. The PowerShot A3400 IS is one of six all new A-series cameras Canon introduced for 2012. Priced between $109.99 and $199.99, the A-series is designed for novices and includes a number of great automatic features and even a brand new Help Button to make even the most technophobe among us confident with this new gadget. The A3400 is priced about $20 less than the flagship A4000 IS. Both models include Intelligent IS (optical image stabilization), and while the A3400 only has a 5x optical zoom, it actually includes a touch screen 3.0-inch LCD viewfinder, a feature not found on the more expensive model. Other than those differences, the A3400 IS is virtually identical to its A-series siblings, which deliver a 16-megapixel CCD image sensor, a 28mm (35mm equivalent) wide angle lens, 720p HD video recording, and Smart AUTO; a function which automatically chooses between 32 different shooting modes to help novice photographers take great pictures no matter the settings. 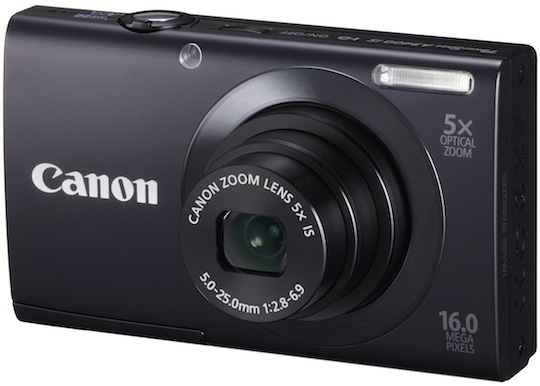 The Canon PowerShot A3400 IS comes in black, silver, red, and gold with an MSRP of $179.99. See our buy box below for the most current online pricing.